1 of 6 Line two 13 x 9 x 2-inch baking pans with nonstick foil, extending 2 inches over short ends. 2 of 6 Break up chocolate; in small bowl, microwave 6 ounces of the chocolate on high for 1 minute; stir. Continue microwaving in 15-second intervals, stirring until melted. 3 of 6 Heat oven to 350 degrees F. In large bowl, beat together butter, sugar, salt and almond extract until smooth. Add eggs, one at a time, beating well after each addition. On low speed, beat in flour until blended; you should have about 5 cups batter. Stir in melted white chocolate until smooth, then chopped cherries. Spread half the batter into one pan. Tint remaining batter with food coloring and evenly spread into second pan. 4 of 6 Bake layers at 350 degrees F for 18 minutes, until toothpick inserted in the centers comes out clean. Transfer pans to wire racks; cool 10 minutes. Turn cakes out onto racks; remove foil; cool completely. 5 of 6 Place white layer on a baking sheet. Spread with apple jelly. Top with green layer. Cover with plastic wrap and place a baking sheet on top. Weigh down with cans to compress. Refrigerate overnight. 6 of 6 In small bowl, microwave remaining 6 ounces white chocolate and cream on HIGH for 1 minute; stir until melted. 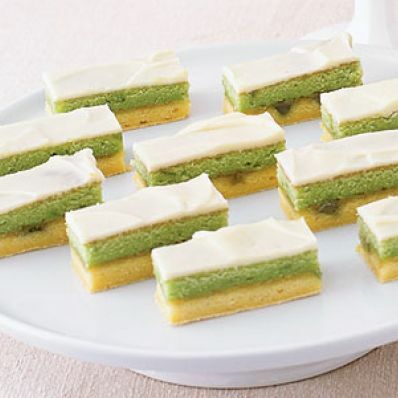 Remove wrap from layers; spread top with white chocolate mixture. Refrigerate, uncovered, 15 minutes. Trim edges. Cut crosswise into 10 strips, each about 1 inch wide. Cut each strip crosswise into thirds for a total of thirty 2-1/2 x 1-inch bars. Per Serving: 0 g fiber, 72 mg sodium, 65 mg chol., 13 g Fat, total, 8 g sat. fat, 249 kcal cal., 30 g carb., 3 g pro.